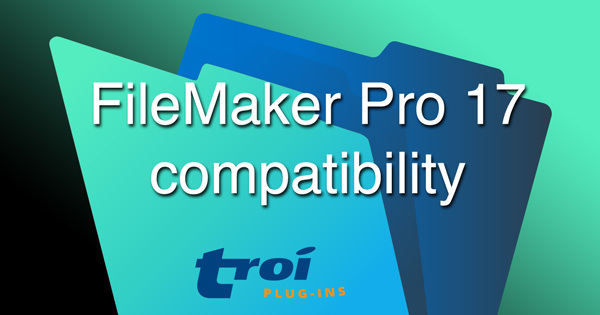 Here you’ll find some information regarding compatibility of Troi Plug-ins with FileMaker 17. We will update this page when we release new versions of our plug-ins. Please check back for updates. In general all our plug-ins that worked with FileMaker Pro 16 still work with FileMaker 17. Please see below for an overview of all Troi plug-ins and their compatibility with FileMaker 17. The plug-in architecture has not changed in FileMaker 17. So there is no need to change your function calls when converting to FileMaker 17. Here is an overview of all our plug-ins that have been tested to work with FileMaker 17 (and also FileMaker Pro 16, 15, and 14).